*Note: There are a few schematics around. One has B10K pot for "Boost" and other A100K. I put in B100K as that pot due to discussion below.. 100K should make it a bit louder, and linear taper should make the sweep feel, well, louder. But use whatever you want. Ok you can mark this one as verified. There is scope for improvements though, it's pretty quiet so it could be worth increasing the volume pot and at maximum blend the fuzz seems pretty quiet in relation to the dry signal for my taste, that could be a personal preference though. Also the main problem I came across was a whine at the top end that vanished when I rolled off the treble a little of my guitar, also hooking up a distortion before it seemed to get rid of it (and sounded really nasty too, in a good way). It's an interesting pedal that's got good scope to be mixed with other effects, but until I can get the blend sorted to my liking I don't think it'll be taking a permanent place on the board. Thanks for the suggestions, I've only got a 500k rev. log but i'll get a 50k on order. I found an original circuit for this that has some 25p caps in there for control, a bit off digging on freestompboxes.org showed up a circuit with someone using 47p caps between pins 1 and 2, and between 6 and 7 of the IC. This seemed to help but not totally eliminate the whine, I've checked my board for bridges so I'm pretty sure it isn't that. It'd be interesting to see if anyone else has the same problem. Did this from Beavis schematic and i do belive it is verified. More info is always welcome... So thank you again. Beavis schematic has Boost as a 100kA. Hmm.. Well it does say rev1 on the file name. How about if we call it even and i change it to B100K :) All quietness should be gone with that. Sorry for the late reply, I've spent the last few days in a hotel room with work, they seem to frown upon getting the soldering iron out there, I can't think why. I tried snipping the 1M resistor (put there to raise the input impedance?) but I'm still getting the whine, I think it's a problem with my build so I'll take another look at it over the weekend. Thanks again for trying to help out. The 1M is used for pulldown resistor to prevent switch popping rather than upping the inpedance. Ha. Got a ton of parts coming my way. Looking forward to building this guy. Thanks. Just built this. I also get a high frequency wine. Either way, I'm not really of fan of this circuit. Nothing special really. 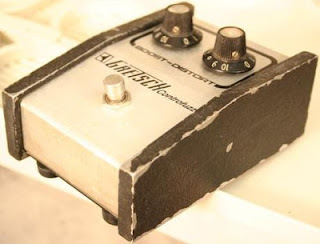 Just sounds like a fuzz with a clean blend. And you can never really get rid of the clean tone completely. And the fuzz its self is nothing amazing either. Fun to slap together though. Thanks again for the layout! Try it with another pedal in front to get the clean tone dirty, then it's got two different fuzz tones, it's different but I agree not the best sounding pedal. I also got the whine, the layout's definitely right but I think the pedal maybe wasn't all that originally, there's not really many videos on youtube to compare it to. If you find out anything about the whine let me know because I never managed to get rid of it. Good luck. Ok so i think i may have solved this. Like madferret i found some info on these compensation caps so i started experimenting with different value caps and eventually found that the best value was 1n running parallel to the 220k resistor between pins 1 and 2 of the chip. Give it a go and see if it works for you. Nice one, now all I have to do is figure out which one it is in the 'needs work' draw. Note to self: Label your circuits before forgetting what they are. Hey Mf, did you manage to get it working? I love mine, offers something different from the Zvex machine and escobedo triple fuzz, i've realised that i love cross over distortion. To anyone building this who's getting oscillation, stick a buffer in front of it, solves all the problems and makes it sound wonderful. 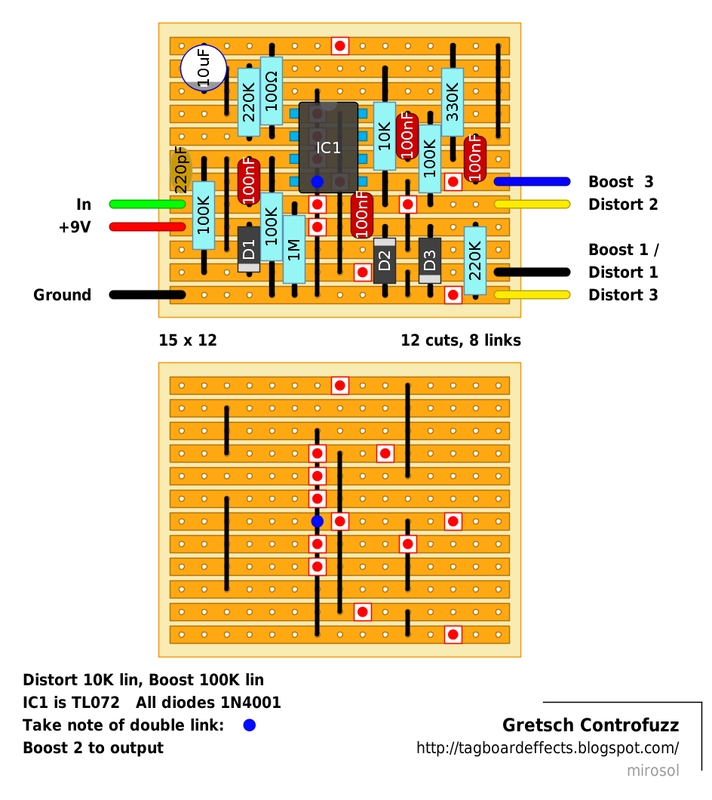 im building this on my beavis bboard and i found out that at high fuzz mix you can get rid of the clean signal if you get rid of the diodes(you can only still hear the clean signal if you strum your strings quite hard. Im new at guitar pedal building so i dont know if this is a bad thing to do. 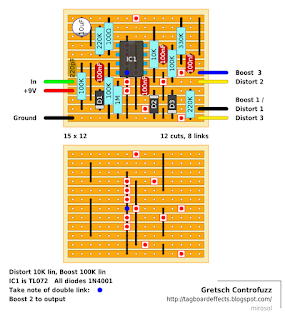 I was also using the 1N4007 diodes so i dont know if the clean signal being present at high fuzz mix is because im not using the 1N4001, but i doubt that being the case. You also get a small volume boost if you do this.